Product prices and availability are accurate as of 2019-04-12 01:35:36 EDT and are subject to change. Any price and availability information displayed on http://www.amazon.com/ at the time of purchase will apply to the purchase of this product. A decidious Shrub growing to 3 m (9ft 10in). It is hardy to zone 3 and is not frost tender. The common wild black raspberry; 1/2" white flowers followed by clusters of delicious shiny black fruit. 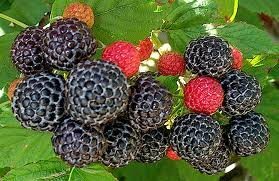 Its common name Black Rasperry is shared with the closely related western American species Rubus leucodermis . The flowers are hermaphrodite (have both male and female organs) and are pollinated by Insects. Other names occasionally used include wild black raspberry, black caps, black cap raspberry, thimbleberry, and scotch cap. 20 Seeds Rubus Occidentalis Clusters of delicious shiny black fruit. Great fruit shrub Other names occasionally used include wild black raspberry, black caps, black cap raspberry.